Ascend Education Center has a clear complaint process for students to follow if they become dissatisfied with a school procedure, the performance of a school employee, or if the student has a grade complaint. We regard complaints as an effective improvement mechanism as they provide us with direct feedback on our areas of deficiency. Ascend Education Center has a comprehensive system of managing customer complaints. There are three stages in addressing student complaints. The first two steps are internal to the school and the final step involves bringing the issue to the attention of an external third party as stipulated in your PEI-Student Contract. 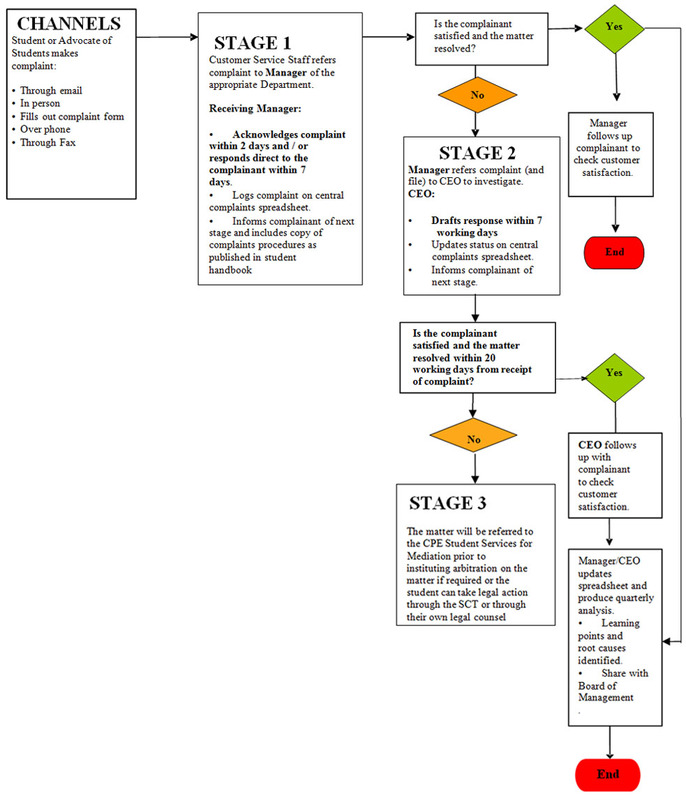 The flow chart describes and illustrates the sequence of the complaint process which has 3 clear stages. Each stage must be recorded on the feedback log; deadlines adhered to and advice given about the next stage. Stage 1 – the initial complaint is acknowledged within 2 working days by the manager of the service(s) about which the complaint was made, and responded to within 7 working days. All stage 1 complaints should be logged on the customer feedback log. If a response cannot be made within the 7 working day timescale the complainant should always be kept informed and given a revised timescale for the response. On meeting with the student/student’s advocate the relevant manager shall ensure the complaint form is completed and acknowledged by both parties as a formal record of the proceedings. Stage 2 – If the complaint is not resolved at Stage 1, the relevant manager shall refer the complaint to the CEO for investigation. The CEO shall respond within 7 working days from receiving the complaint and attempt to resolve the issue. For amounts that exceed SGD$10,000 but is below SGD$20,000, the claim can still proceed with SCT if both parties consent to it in writing. If the student approaches CPE’s Student Services Centre (SSC) for help. SSC will review the issue and may refer the dispute to CPE Mediation – Arbitration Scheme. If the dispute is not resolved through mediation at Singapore Mediation Centre, the dispute will be referred for arbitration by an arbitrator appointed by the Singapore Institute of Arbitrators. Students may wish to initiate a case to the CPE Mediation-Arbitration Scheme if they are not satisfied with the outcome / actions taken by the Centre. The Student can approach CPE Student Service Centre who will assist the student in filling out an application form, stating the nature of their dispute. The application form will then be sent to the Singapore Mediation Centre (SMC), who will contact the Student and the Centre within 7 working days for an appropriate date to hold the mediation session. Before the day of mediation, the parties involved will exchange through the SMC a concise summary of the case, as well as copies of relevant documents referred to in the summary that the parties wish to rely on during mediation. At the end of Day 1 of mediation, if the parties are able to arrive at an agreement, the mediator will draw up a settlement agreement and close the case. However if there is no settlement, the Student can decide if they wish to proceed to the arbitration stage, which is a paper-based review of the dispute. The arbitrator may call for a hearing if he or she deems it to be necessary. The Student will be required to submit a request to the Singapore Institute of Arbitrators (SIArb) to commence arbitration, and within 14 working days of receiving the request, CIS will submit to SIArb its defence. The Student will have another 14 working days to submit their reply to SIArb upon receiving the Centre’s defence. For a documents-only arbitration, the arbitrator will publish his or her arbitral award within 60 days from the commencement of the arbitration, while if a hearing was held, the arbitrator will publish his or her award within 90 days from the commencement of the arbitration. Trends, lessons learned and identification of root causes are analysed and shared for staff training and continual improvement.